So the other day Sir Cussalot, the Granddollars and I went “out town” (as the locals say). Town, Chehalis, Washington, is about twenty minutes away. We had some errands to run and one of those took us to the local pet store for some Wellness Core Reduced Fat kibble for MeMe. She has had several bouts of pancreatitis and needs a low fat food. This particular pet store is a smaller version of Pet Smart or PetCo, but still a good size store. As we walked up and down the aisles in search of some new toys for FIRE, the girls spotted the cutest dang doggie dresses They pulled one off the rack and came running over to us, “TACO! LOOK! IT IS ADORABLE!! !” A while back the Granddollars picked nicknames for all of us and Julia dubbed Sir Cussalot, Taco. Julia loves to play the song, “It’s Raining Tacos!” for him when she wants to see him smile. It works every time. “Why not?” both girls asked in disbelief. “Because it will make her look like a sissy girl,” he grunted. The three of us pleaded with him but he refused to budge. We couldn’t believe his shortsightedness! She would look ADORABLE in this outfit. It was so SASSY! 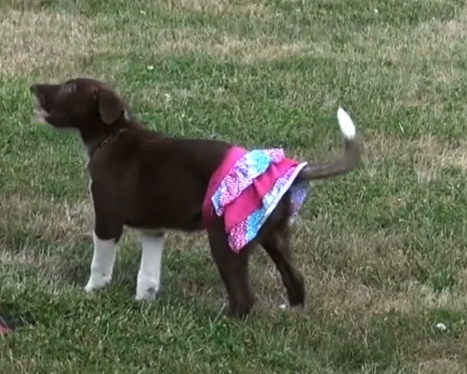 I could just see her strutting her sassy little red behind wearing the colorful ruffled skirt. We finally gave up. It was clear he was not changing his stubborn mind. “SURE GRAMMA!” Then she whispered, “Let’s get that ADORABLE skirt for FIRE.” I smiled in agreement. No mean ole Sir Cussalot Taco Killjoy to spoil our fun! Sicily picked out a great one for FIRE. We smiled at each other knowing how cute she would be in her skirt and off we went. I never said a word to Sir Cussalot Taco Killjoy about it. I wanted to surprise him. So late that afternoon when we got home from agility class, I grabbed the hidden skirt and FIRE and headed outside. As I was leaving, I told Sir Cussalot to grab the camera. “WHY? I’m tired!” he mumbled in disgust. Then he slumped his shoulders in despair, made some noise to show how exasperated he was with me, picked up the camera and followed me outside. After forty plus years together, he has learned that he might as well give in early because eventually he will have to anyway. He still did not know what we were doing. “Where the F#@K are we going and what are you doing??? ?” he demanded. I had put the skirt on her already but he couldn’t see it. I told him to get ready because the camera needed to start running as soon as she hit the ground. He grunted and started the camera. I put our fiery little redhead down on the ground and off we went. The video captures Sir Cussalot’s response to seeing the FIRECRACKER in her ruffles for the first time. Although he wouldn’t admit it, I saw a smile on his face after a bit. He couldn’t deny just how cute she was! Sir Cussalot Taco Killjoy’s reaction to seeing FIRE in her TUTU for the first time: PRICELESS!!!! WARNING! VIDEO CONTAINS VERY NAUGHTY WORDS!!!!! Posted in agility, dog, Double J Border COllies, FIRE!, Helen Grinnell King, Puppy Agility, Puppy training, Sir Cussalot, Travel Supremes | Tags: FIRE! OMG !! Hilarious. she is so darn cute and seems to take everything in stride. I love it maybe Fire would like some pink boots like Marthas.